Asphalt may seem tough and durable, but add up the effects of traffic and the elements, and you'll see how quickly commercial asphalt can wear down. 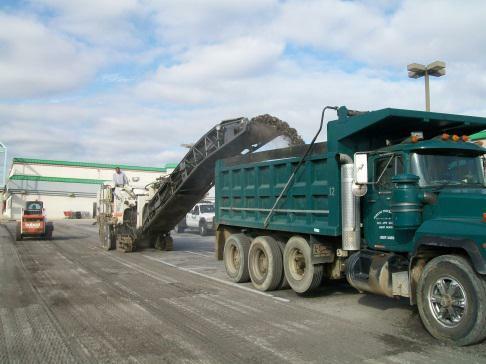 PTG Enterprises has paved thousands of miles of asphalt lots, and our crews work quickly and professionally. 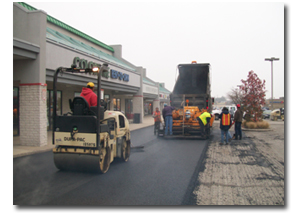 With PTG each phase of the project will be executed with an attention to detail that other asphalt paving contractors don't possess. We'll establish timetables and plans that ensure the job gets done quickly, without impacting traffic flow or accessibility for customer and tenants and/or residents. 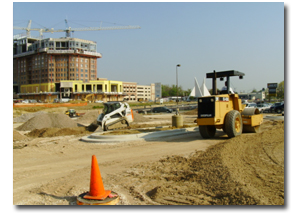 Site work is the work around and outside a newly constructed structure or an addition to an existing structure or parking lot. Just about always, the project consists of a set of a city, state or county stamped approved set of drawings describing the entire scope of work in specific detail. Those drawings provide the necessary scope for the grading of the project, installation of stone, concrete curbing and sidewalks, parking lot profiles and specs., signage, striping, wheel stop layouts and quantities, fencing and landscaping. Every property has its own unique grade so it is important for this to be accurate and true to the drawings. The grade will determine storm water management. If performed incorrectly, even if only by a few degrees, water may pond and become an issue. I have the experience needed to ensure your grading is completed successfully. Different soils will require different sub-grade stone. In most cases, sample core testing was conducted prior to the start of the project and the drawings specify a specific type of stone. But, often isolated areas of the site will be found to have "soft spots" and undercutting is required. Being able to evaluate these areas, work with the onsite Geo-Teck Engineer and resolve the issues to ensure the project does not fall off schedule is what we do well. All parking lots have a need for curbing and sidewalks. Curbing is designed to catch storm water into its gutter pans and direct that water to storm drains. It is important that the initial installation of the curbing be installed at proper grades to ensure a constant falling flow until the water has reached the drain. If installed improperly, ponding and water issues will quickly appear where grades are off. At those locations the client could expect standing water. 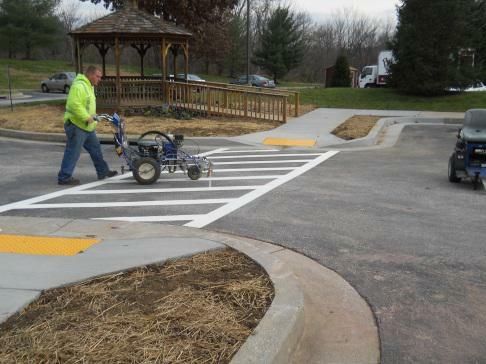 Flatwork consists of items such as sidewalks, aprons, dumpster pads and handicap ramps. In most new construction flow chart schedules, the curbing and flatwork is performed before the stone install and fine grading. We have been on projects where just a couple of inches have affected the grade of a lot. In that case, the error was corrected well in advance and didn't affect the schedule of the project. Having a contractor with the proper experience is vital. 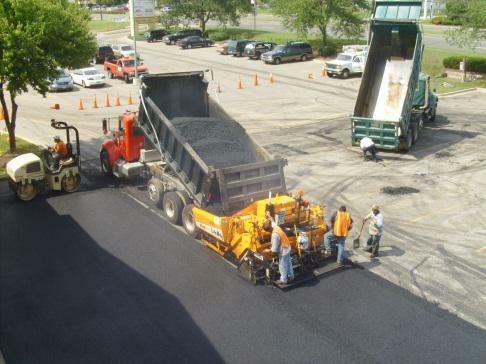 The installation of the asphalt is the most critical phase of paving. But, a paving machine paired with an experienced operator and a trained crew will make paving look easy - it's not. Assuming fabric was not in the scope of work, than the paving team will have a man designated to either spray or spot apply tack coat material along any concrete gutter pan or sidewalk reveals. Another ground personnel will be responsible for controlling the movement of trucks. It's crucially important that the trucks stay in order and the next one up is always ready to go. The hotter the asphalt the easier it is to work with, hence the longer a truck sits the cooler the asphalt gets. The asphalt is dumped from the truck to the paver where two men control each side. One man is responsible to make sure the joint lines up with the previous paving pull and the other side is responsible for determining thickness, grade, pitch and fall. Accompanying the paver are usually two ground personnel called "Lute Men". They take direction from the paving foreman and will spread / rake high and low spots out of areas that were just paved but need minor adjustments. Finally, there is the roller man. He is responsible for the compaction of the freshly laid asphalt. Usually this person will work the roller and also plate tampers and hand tampers in the tight areas where pavers and rollers cannot go. Every new construction project will have its own set of specific requirements that run hand in hand with the type of property. For example: a church or area with light traffic may have a profile of a modest four inch thickness of asphalt because of its light traffic. In another case, a property like a shopping center may have a profile of six inches to increase its strength. In rigorous cases like heavy industrial and roadways, profiles can be eight to 12 inches thick. Asphalt gets it strength from its profile, so the thicker the asphalt -- the stronger the parking lot. Regardless of the thickness, the way the asphalt is installed is the same. First, remember you're paving over loose stone, so it is important to roll the stone a final time to ensure a tight compaction and ensure there are no soft spots. Next is your base course asphalt, usually installed at two, three, or four inches and compacted to between 92 to 97% compaction. Then, a second base or intermediate course of asphalt is installed IF NEEDED. Finally, the surface course of asphalt is installed at 1.5, 2.0 or 2.5 inches and compacted to between 92 to 97%. Ideally the area is left closed to all traffic for 24 hours and allowed to harden. These are "the extras" as we like to call them. Regardless of how well the excavation, grading, concrete installs, stone placement and asphalt was laid, what's going to stand out to the average passerby is the brad new striping against the fresh black asphalt. 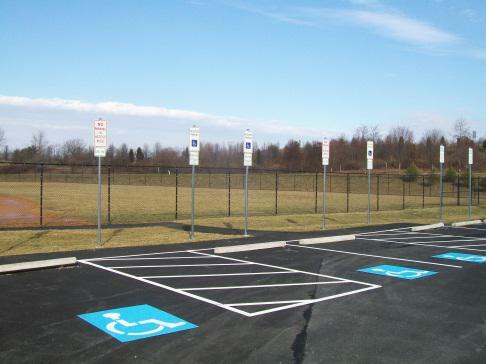 The new paint, signs and wheel stops give your parking lot a "WOW" finished look. Performing this type of work is much different than just re-striping an old lot. In most cases, there is a detailed architectural rendering of what the finished parking lot looks like. These drawings show measurements of such things as: drive lanes, stall widths, size of hash outs, even in some case the thickness of the paint line itself. There is only one shot to get this right because it is virtually impossible to remove paint from asphalt. Fencing & Landscaping Although these are not jobs that we typically manage, we have a reliable list of sub-contractors that we have worked with, or we can work with the general contractors choice of sub-contractors. Regardless, constant communication with these contractors is the key to a successful job. The parking lot installation phase of a new construction project can be assigned / subbed-out to just include the installation of the asphalt. 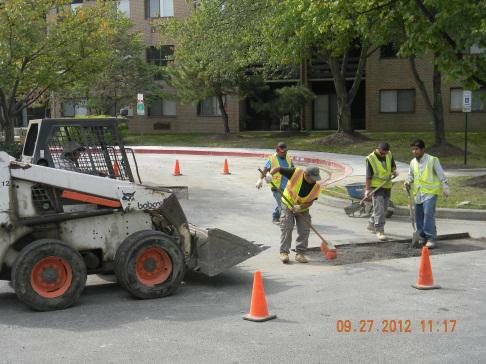 This assumes that all the other work leading up to the asphalt installation was completed by another contractor. This is very common. 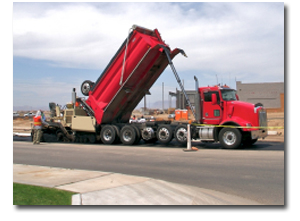 Many general contractors or excavating companies will own the earth moving equipment needed to work a construction site but not the paving equipment. In those cases, they bring in a contractor ( us ) to oversee just this aspect of the larger project. Timing and communication are key. The stone contractor and the paving contractor must work closely together. As soon as the stone goes down and is fine graded it should be covered with the first layer or base course of asphalt. This will cap the stone with an impermeable cap and protect the integrity of the sub-base. The installation of the asphalt is the most crucial phase of paving. But, the paving machine paired with an experienced operator and a trained crew will make paving look easy -- it's not. Assuming fabric was not in the scope of work, the paving team will have a man designated to either spray or spot apply tack coat material along any concrete gutter pan or sidewalk reveals. Another ground personnel will be responsible for controlling the movement of trucks. It's crucially important that the trucks stay in order and the next one up is always ready to go. The hotter the asphalt, the easier it is to work with, hence the longer a truck sits, the cooler the asphalt becomes. The asphalt is dumped from the truck to the paver where two men control each side. One man is responsible to make sure the joint lines up with the previous paving pull and the other side is responsible for determining thickness, grade, pitch and fall. Accompanying the paver are usually two ground personnel known as "Lute Men". They take direction from the paving foreman and will spread / rake high and low spots out of areas that were just paved but need minor adjustments. Finally, there is the roller man. He is responsible for the compaction of the freshly laid asphalt. Usually this person will work the roller and also plate tampers and hand tampers in the tight areas where pavers cannot go. Every new construction project will have its own set of specific requirements that run hand in hand with the type of property. For example: a church or area with light traffic may have a profile of a modest four inches thick of asphalt because of its light traffic. In another case, a property like a shopping center may have a profile of six inches to increase its strength. In rigorous cases like heavy industrial and roadways, profiles can be eight to 12 inches thick. Asphalt gets it strength from its profile, so the thicker the asphalt, the stronger the parking lot. Regardless of the thickness, the way the asphalt is installed is the same. First, remember you're paving over loose stone, so it is important to roll the stone a final time to ensure a tight compaction and ensure there are no soft spots. Next is your base course asphalt, usually installed at two, three, or four inches and compacted to between 92 to 97% compaction. Then a second base or intermediate course of asphalt is installed IF NEEDED. Finally, the surface course of asphalt is installed at 1.5, 2.0 or 2.5 inches and compacted to between 92 to 97%. Ideally the area is left closed to all traffic for 24 hours and allowed to cure and harden. These are, "The Extra's" as we like to call them. Regardless of how professionally the stone was installed or the asphalt laid, the striping, signage and wheel stops add the real curb appeal. Newly painted white lines against freshly laid asphalt, with signs and wheel stops give the parking lot a "WOW" finished look. Performing this type of work is much different than just re-striping an old lot. In most cases, there is a detailed architectural rendering of what the finished parking lot looks like. These drawings show measurements of such things as: drive lanes, stall widths, size of hash outs, even in some cases the thickness of the paint line itself. There is only one shot to get this right because it is virtually impossible to remove paint from asphalt. ( You can grind the asphalt away or black paint over it ) Don't leave your new project to chance. We have managed hundreds of these projects and have the experience you need. 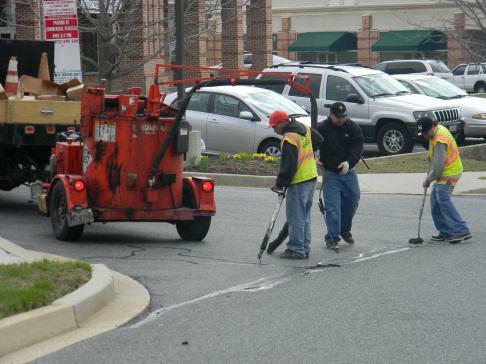 Whether you have a small pothole that needs to be fixed or a more involved asphalt repair project, we have the equipment and resources to complete quickly and correctly. 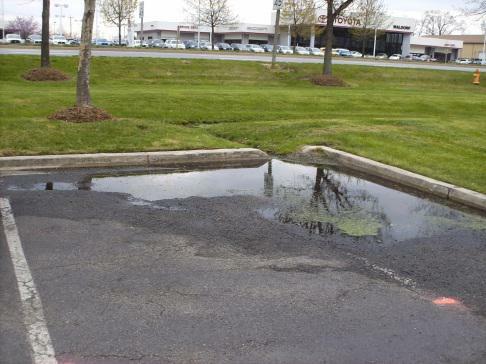 Is the most cost effective way to protect your parking lot. This prevents water penetration by ensuring pavement cracks are always properly sealed. Has many benefits: it protects the pavement from the elements and re-beautify the parking lot with a fresh jet-black look. 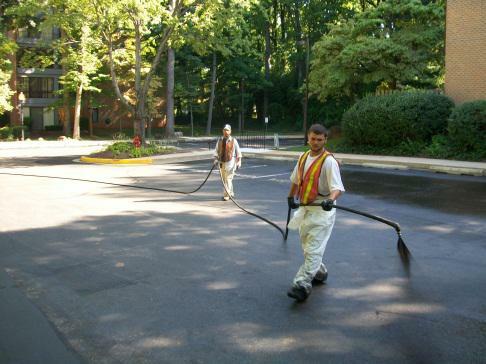 Our experienced crews use only the best commercial grade sealers and always follow "Best Practices" for application. You can be assured you are receiving a "Top-Notch" job with PTG. 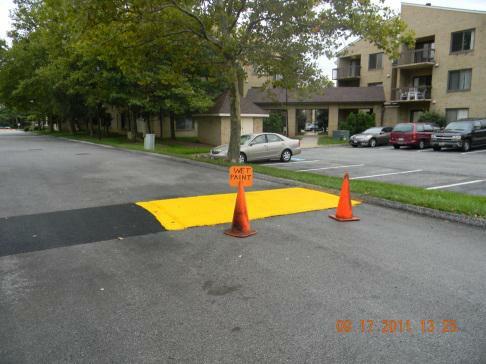 Whether you need a new layout or a re-stripe of an existing lot, PTG has the experienced crews to get the job done. 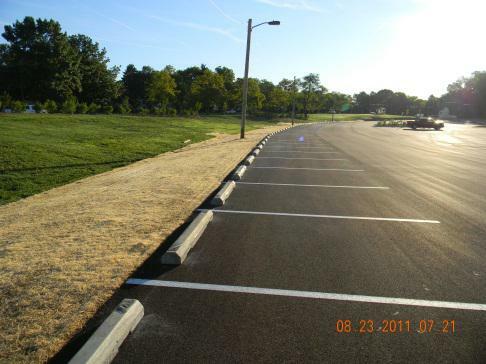 New parking lot striping will add instant curb-appeal to your property. Signs go missing, become outdated/faded or are damaged when vehicles hit them. No matter the reason, PTG will keep you current and in compliance with all your parking lot signage requirements. Become damaged over time and need to be replaced. Or, a need will develop that requires speed bumps to be installed on an existing lot. Regardless, we will construct or re-construct the speed hump or bump to fit the need. As cars and snow plows continually bump them, they become dislodged and break. We will un-install the old ones and replace with new wheel stops. If the sub-base is solid but the surface wearing course is showing signs of age, a surface overlay may be the solution. These can be frustrating and a liability issue for the property. Our professional estimators can work with you to develop solutions to correct these problems. 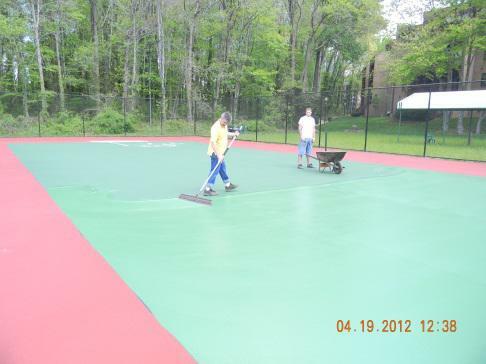 PTG offers repair or resurfacing services for both tennis and basketball courts. We use only the best acrylic resins and quality pigments to achieve durable and vibrant surfaces for professional, recreational, and residential installations. PTG will excavate the deteriorated pavement surface using a "milling" machine designed to grind off the deteriorated layers of pavement. Once milling is complete our crews will prep and re-pave the area. If no part of the parking lot or roadway is salvageable then it must be re-built. 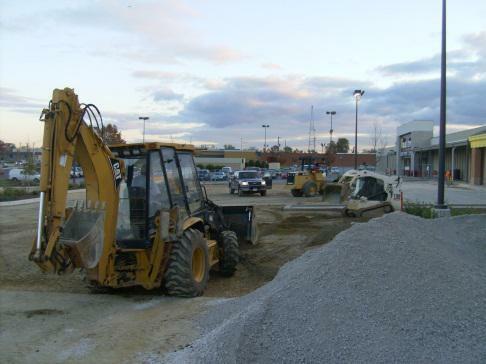 With this type of project, the demolition and excavation becomes a critical aspect of the project. This is where PTG excels. Our crews are highly trained in the art of demolition.